Building on its legacy of high-capacity, high-efficiency combines, Case IH is expanding its combine lineup with new 50 series Axial-Flow® combines, which includes new Axial-Flow 250 series combines equipped with optional AFS Harvest Command™ combine automation system. Designed to optimize grain quality and grain savings, the 250 series combines feature 2-speed electric shift ground drive, adjustable rotor cage vanes and improved feeder house design. Plus, AFS Harvest Command automation simplifies harvesting by sensing and optimizing machine settings — regardless of operator skill level. With the new 250 series Axial-Flow® combines, you can choose from three levels of automation technology so you can pick the right level to fit your operation. Plus, Model Year 2019 combines come with factory-fit telematics and a one-year subscription to AFS Connect™ command center to monitor and manage your fleet. Feedrate Control: Optional Feedrate Control to more accurately control ground speed based on crop load, engine power and ground speed limits set by the operator. Full Automation: Optional AFS Harvest Command™ combine automation system proactively senses and optimizes machine performance for you. 250 series combines have a redesigned feeder house for improved durability and reliability in demanding crop conditions. An optional feeder fore/aft face plate control enables adjustments to be made from the cab. A redesigned feeder top shaft drive coupler features a crown spline design for greatly improved durability. 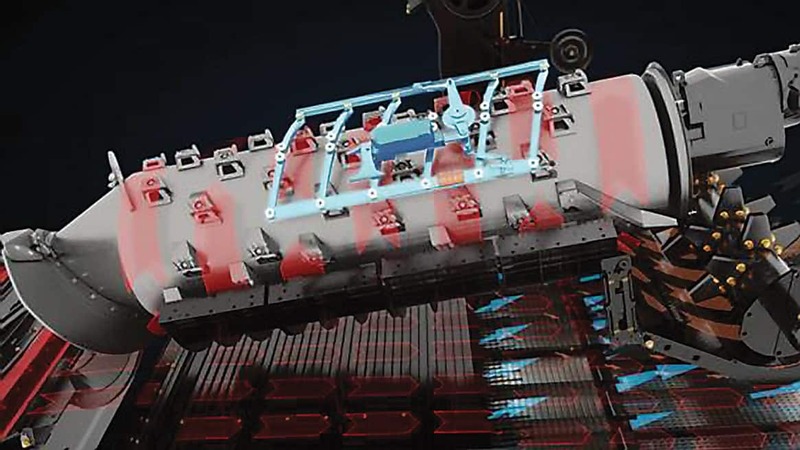 A simple, two-piece feeder floor design increases durability and improves crop feeding. Plus, up to 13,500 pounds in lift capacity helps handle even the largest chopping corn head on the market. The Case IH residue management system is built to handle the tough residue associated with new crop genetics. This system delivers consistency across the larger header widths used on the Axial-Flow 250 series combines, helps prepare the ground for next year’s crop and can create consistent windrow formations and long straw for baling. From tillage to livestock demands, we offer the widest range of residue management features on the market. Eliminate Guesswork. Simplify Your Harvest. Case IH Advanced Farming Systems precision farming solutions integrate technology into your combine to put you in control of your harvest. From new AFS Harvest Command™ combine automation system to the factory-installed AFS AccuGuide™ autoguidance system and more, you have the tools to optimize harvest — no matter the field conditions or operation skillset. With the 250 series, AFS Connect™ is standard equipment complete with advanced and file transfer subscriptions, installed at the factory. With 402 hp at 2100 engine RPMs and a 315-bushel tank, the Axial-Flow 7250 combine delivers superior performance and capacity. 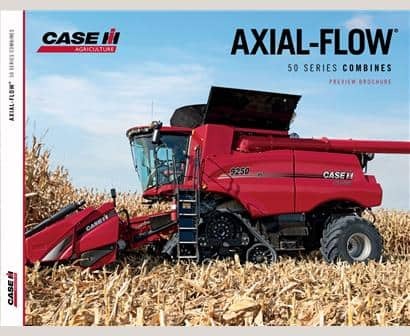 The Axial-Flow 8250 combine, with 480 hp at 2100 engine RPMs and a 410-bushel tank, provides unmatched horsepower and the performance you've come to expect from Case IH. The Axial-Flow 9250 combine, with 550 hp at 2100 engine RPMs and a 410 bushel-tank, provides ultimate power to handle demanding field conditions and heavy loads.